*Note: This is not a sponsored post but it does contain affiliate links. Thanks for supporting those who support Chow Down USA! Hope everyone had a happy 4th of July weekend! We seem to be on a roll of taking impromptu trips lately (you may remember our drive up to Marblehead and our weekend in NYC). Our latest adventure took place in Portland, Maine! We took the train to avoid traffic, which took about 2.5 hours and was a great smooth ride. The wifi wasn’t the best, but I was able to get some blogging done which is always nice! Portland is a cute coastal city, and the area is filled with picture perfect lighthouses and great restaurants. We took a short drive up to Cape Elizabeth to enjoy these incredible views and see this 200 year old lighthouse! Cape Elizabeth was sunny yet breezy, so I donned my trusty Ray-Bans, this super comfy long sleeved white lace romper (on sale at Express! 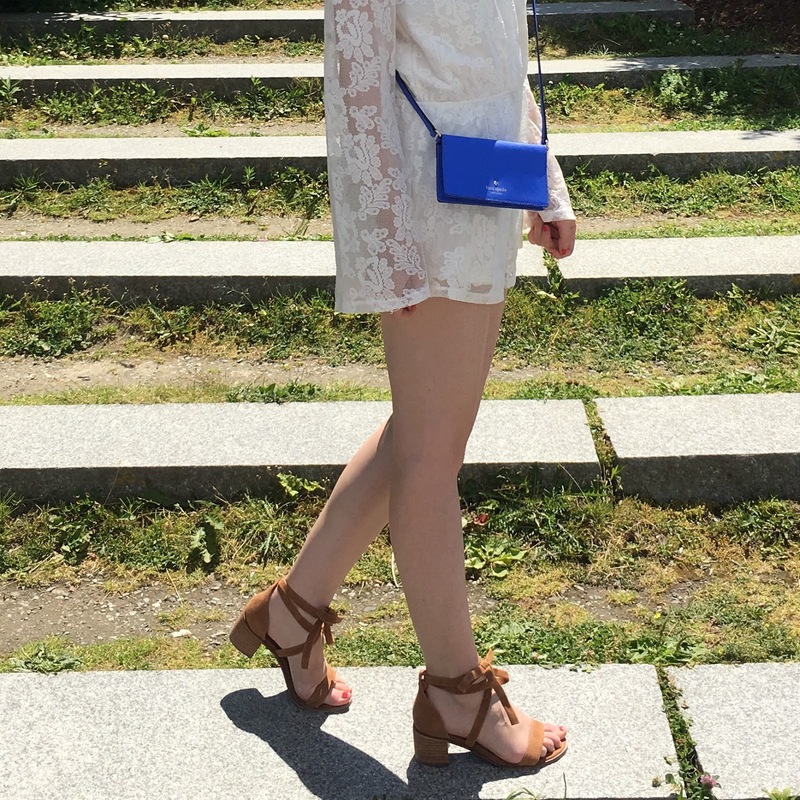 ), an “adventure blue” Kate Spade crossbody, and my newest obsession: cognac Steve Madden lace-up sandals. I’m not a fan of wearing uncomfortable super high stiletto heels, so these are the perfect combination of comfort and style for me. I walked around Portland for 2 days straight in them, and my feet still felt pretty good after! I’m pretty much obsessed with every item in this outfit, and plan to put them all on repeat for the summer!